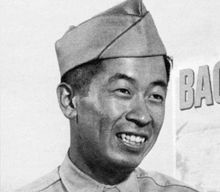 CAMARILLO, Calif. (AP) — Ben Kuroki, who overcame the American military's discriminatory policies to become the only Japanese American to fly over Japan during World War II, has died. He was 98. Crew members nicknamed him "Most Honorable Son," and the War Department gave him a Distinguished Flying Cross. He was saluted by Time magazine in 1944 under the headline "HEROES: Ben Kuroki, American." In 2005, he received the U.S. Army Distinguished Service Medal, one of the nation's highest military honors. "I had to fight like hell for the right to fight for my own country," Kuroki said at the award ceremony in Lincoln, Nebraska. "And I now feel vindication."